Where Teamwork and Change Make Customers & Employees Better Off! 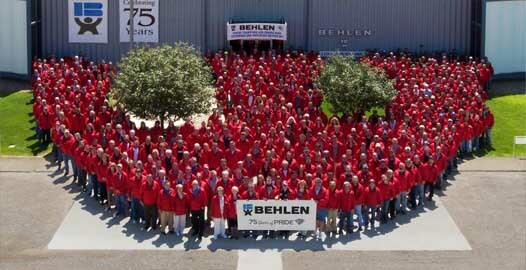 Behlen Country believes that sincere concern for its people, Partners in Progress, translates into superior products and service to its customers. That’s why the core values of the company put people first and recognize the need to strive for continuous improvement and learning.We strive for "value added" to all the products and services it provides. We know that "a total quality commitment" is the key to sustaining business relationships with our customers. We are the only major farm and ranch equipment manufacturer who is ISO certified. We are proud to be ISO9001 certified since 1999. The ISO9001 series of standards assures customers that they will receive a consistent, high level of quality on every order. It means quality is a way of life and must be built into every step of our operation. Achieving ISO 9001 Certification is a result of involved people working together to continually improve our systems and meet and exceed customer expectations.